Two competitors were killed during the opening day of the Isle of Man TT Races on Saturday. 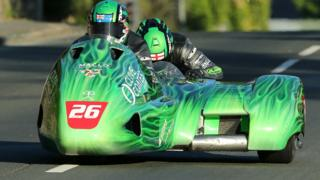 Sidecar driver Dwight Beare, 27, crashed near the Rhencullen section of the Mountain Course at about 14:10 BST. His passenger, Benjamin Binns, was airlifted to the island's Noble's Hospital, with a fractured ankle. His condition was described as "stable". Later, Paul Shoesmith, 50, died in a crash on Sulby Straight during solo practice. The session was abandoned. Shoesmith, from Poynton in Cheshire, made his TT races debut in 2005 and had a highest placed finish of 15th on the TT Mountain Course in both the Superbike and Senior Races in 2011. He achieved his fastest ever lap around the TT Mountain Course in Saturday's Superbike Race, lapping at 125.896mph and finishing 29th. The sidecar race was immediately red-flagged following the accident but was later re-run. Beare made his debut at the annual road-racing event in 2014 and finished 12th in the second race of the week, with his father Noel as his passenger. He returned last year and secured a 17th-place result.